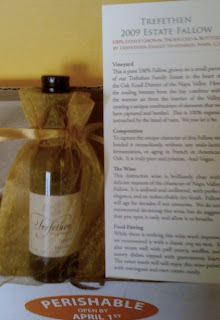 On April Fool’s Day I wrote about a mini bottle of Trefethen Fallow—the wine so airy it defies gravity—and then on that very same day I received another box from Trefethen with more of the same miniature bottles. I figured they might be filled with the missing elements of earth and fire to complement the wind I’d already received, but I was happy to see there was actual wine in the tiny bottles. 50ML to be exact. So what was this all about? Were they trying to get around the 3 oz rule on airlines? Making an appeal to wee folk who enjoy fine wine? As it turns out it’s not a joke but a sample of a new process called T.A.S.T.E , which is an acronym for Total Anaerobic Sample Transfer Environment developed by Tim Bucher at his company the TastingRoom. The T.A.S.T.E. Technology sounded rather spy like. Maybe they had the Man from U.N.C.L.E (United Network Command for Law and Enforcement) brainstorm with them or James Bond’s evil nemesis SPECTRE — Special Executive for Counter-intelligence, Terrorism, Revenge and Extortion— give them a few ideas. But a good acronym is apparently hard to find. Anyway, the box contained two, too cute for words, mini bottles of the Double T 2008 Napa Valley Chardonnay and the 2007 Napa Valley Red Wine. I tried them both and can say they were both very good and the samples did create a desire to get an actual full size bottle. But I like the tiny bottles too and could see how useful they might be for those times when full size bottles can be awkward, like at the movies or at church. The folks at Trefethen are working over time to be fun and creative and thank goodness their wine is worth all the effort. I really need to get over there and see if they don’t all wear red rubber noses or drive around in clown cars like the Shriners. Stay tuned…. This months Wine Blogging Wednesday is hosted by Frank Morgan. I met Frank at the 2009 WBC and I follow his wine blog Drink What YOU Like. The topic Frank selected was Gamay and I was looking forward to discovering what Gamay, the grape variety grown in Beaujolais France, is all about. I picked up a bottle of 2008 Jean Foillard Morgon Cote Du Py and brought it along on a road trip to Death Valley National Park. My idea of a successful road trip always includes a cooler stocked with some good wine. Our lodging choices were going to be very bare bones in Death Valley so I made sure our provisions would make up for the lack of creature comforts. Along with the Gamay I brought a bottle of 2007 Grenache/Syrah/Mourvedre from Quivira and Bonny Doon Le Cigare Volant 04. 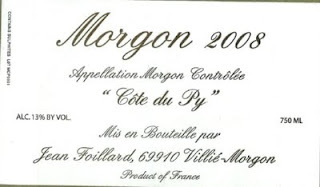 I liked the Morgon. It was light with nice acidity and berry flavors. I thought it had a scent of violets but maybe that was due to my ultra violet exposure in the desert. But it did seem to have a distinct floral aroma to it. It also had a peppery component that reminded me of Pinot Noirs I’ve had in the past. We tried the Gamay one night in our motel room with some slices of navel orange and Ricciarelli cookies. Ricciarelli are delightful Italian cookies made from almonds, sugar and egg whites. They are soft, just short of squishy, and not too sweet with a light dusting of powdered sugar and a trace of vanilla and orange. They paired quite well with the wine. I would definitely try this wine and others like it again. I think Gamay is a great choice to pair with desert sunsets and spring wildflowers. And I must admit nothing upgrades a cheap-o Motel 6 room better than a good wine. Got Gamay? I do now. I won’t take a another road trip without it! What to Pair with Air? Lately I’ve been gravitating towards wines with a more delicate body and recently I received a sample that goes beyond belief in delivering an airy unfettered lightness. 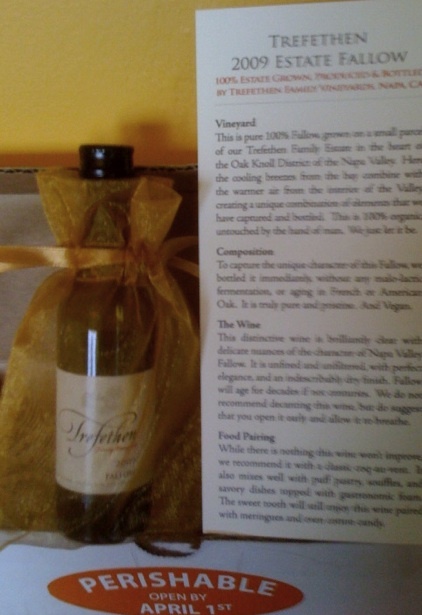 The 100% organic Trefethen 2009 Fallow Estate from Napa County is a text book example of the relentless pursuit of folly. Or in this case fallow. Fallow Grapes. Harvested from Trefethens fallow ground vineyard, the 2009 Fallow has minimal handling. Very minimal. It’s unsullied without the use additives, and no barrel aging. No aging at all actually. It’s the Dorian Gray of wines—it will be forever fresh and young. On the nose this wine is elusive. The scent can take you anywhere the wind blows. On the palate it’s equally light and dry, so dry that if this wine were a comic it would be Jack Benny, or perhaps David Letterman. I suggest you try this wine on its own without food, since anything you eat with it may overpower its wispy nature. So put on some music, I think the Hollies “All I Need Is The Air That I Breathe” is the perfect match and grab a good book --I recommend The Unbearable Lightness of Being by Milan Kundera-- and enjoy a glass of Trefethen Fallow preferably on April Fool’s Day.